The next day had much better weather — while it was still misty in the morning, it steadily cleared up, and confirmed the wisdom of just hanging out the afternoon before in the warmth and dry of our room. Over in the post, “A Culture of Kindness“, I mentioned the Community Bus — this was a day where we used it. The only people who got on the Community Bus were elderly people and pilgrims, like us. The elderly were dropped off at community centers, hospitals and clinics, an old folks home — and all the pilgrims were dropped at an unmarked spot by the side of the road. We traipsed more or less together through the countryside. We passed by a massive chicken farm — something I was rather interested in. We ate eggs every day, and chicken from time to time, but I had not seen a single chicken in the country, whereas I had seen cows several times, and pigs at least once. The chickens were in massive ventilated sheds, and I could hear them clucking and cheeping, but they were hidden, so I have no idea of their condition of living. After several kms of walking, all of us pilgrims arrived at the Unpenji Ropeway station at about the same time — just as the aerial lift car had left. So, we had twenty minutes to kick around, look at the souvenir shop, and maybe buy snacks. Taking the ropeway cuts out about 5 kms of walking to Unpenji, Temple 66, which is at the highest elevation of any of the temples, at 927 m. The ropeway is the longest in Japan. The top of the ropeway doesn’t just lead to the temple, it also leads to a small ski area (closed March 10), and a paragliding launch area; and there’s also a big statue of some god holding a trident, but I never found out exactly who it was. We got off the car, and it was quite a bit colder. It was too misty to see any view. I put on my jacket and vest. 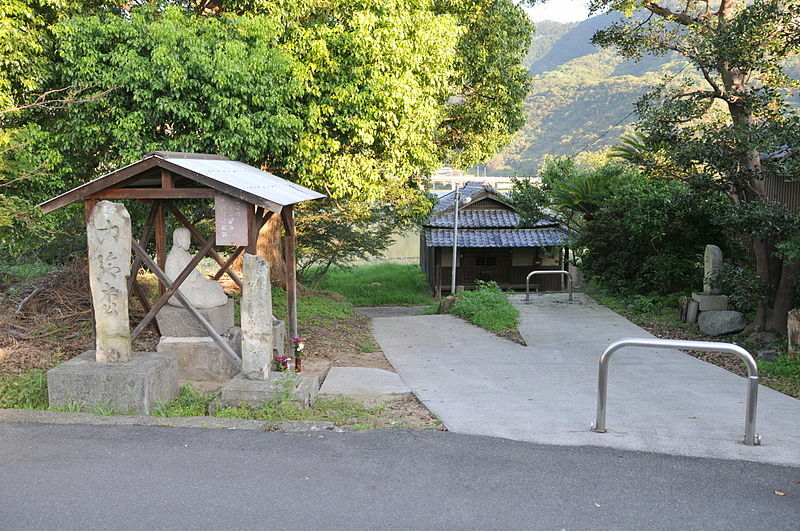 The trail from the ropeway to the temple is lined with statues. 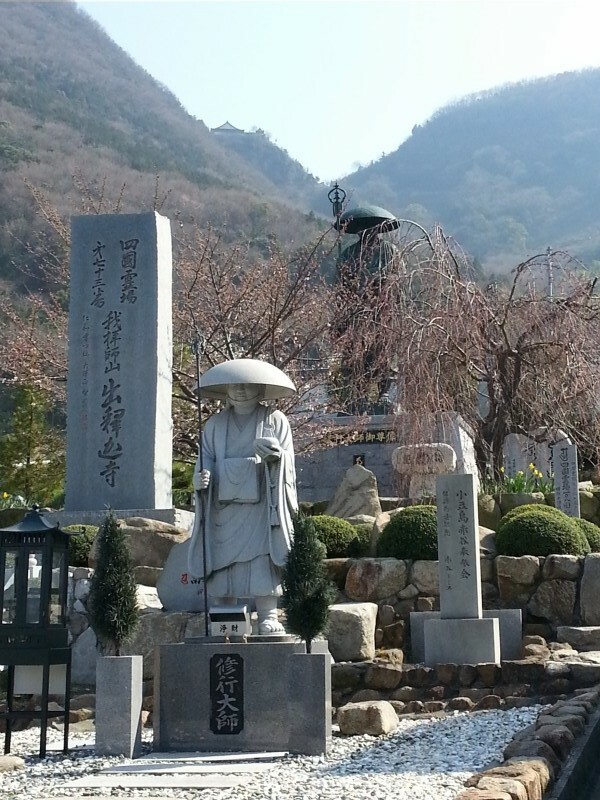 These statues depict all the followers of the Buddha, arhats, who were present at his death. They are also supposed to depict all the kinds of people there are in the world. I thought these were sort of cheesy, but Ann liked them. The temple had many new elements, and a section was under construction when we were there. I think something like the ropeway really helps these mountain temples, because rather than it being a long hike to reach them, ordinary people come up to the top of the mountain to see the view, and then when they’re there, they also look at the temple. Then they buy good luck charms, through money in the donation bin, and all of a sudden, the temple’s Net Operating Income looks a lot better than when the ropeway wasn’t there. Apparently it’s a big deal locally to ascend to the top of the mountain on New Year’s Eve, and those throngs of people also make donations and buy things. All of these new visitors fuel the ability to build lodging and fix up temples, and spruce up the grounds. One of the temple’s symbols was an eggplant. You could buy eggplant good luck charms, and they had a large metal eggplant you could stroke for good luck. I have googled things like “sacred eggplant”, and I still can’t figure it out. After we were done at the temple, I noted that of all the pilgrims who came up the ropeway, we seemed to be the only ones walking down. The rest took off back to the aerial car station. We took a trail along the ridge top, seeing more of the hundreds of arhat statues. Then we managed to take the right trail (yay!) down the mountainside that would lead us to Temple 67, Daikoji. The trail ran through the forest, and there were lots of birds. We also saw tons of lizards. We ate our picnic lunch at a shady bench on the trail. After exiting the trail, we were now coming through the valley on a road, past some small lakes, up and over the hill…I was starting to get nervous because I knew, from my conversation with the tourist information office, that the last community bus was leaving about a mile and a half from Daikoji at 3:47 PM. It had been about a ten km walk to Daikoji from the mountain top, and it was now three o’clock. We visited the temple, and at the stamp office, I asked for advice on how to find the community bus stop. The monk there made a dot on my map, and we set off. The rest of the story may be found, again, in my previous post, “A Culture of Kindness“. The Community Bus returned us to central Kannoji. From there, we walked back to our lodging for the night. We woke up to a somewhat drippy morning, which was forecasted to be heavy rain through the afternoon. With this sort of forecast, we did not want to take on that much. 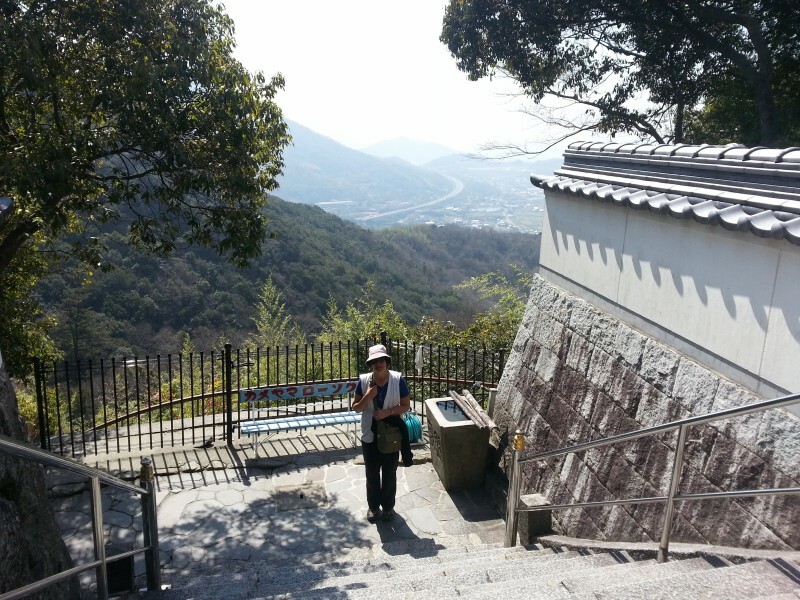 So, we got up, and walked a few kilometers to Kannonji (Temple 68) and Jinnein (Temple 69). These two temples are immediately adjacent to one another, so you get a sort of two-for-one when you visit them. They share a stamp office, but you still pay the fee for each when you get your book stamped. 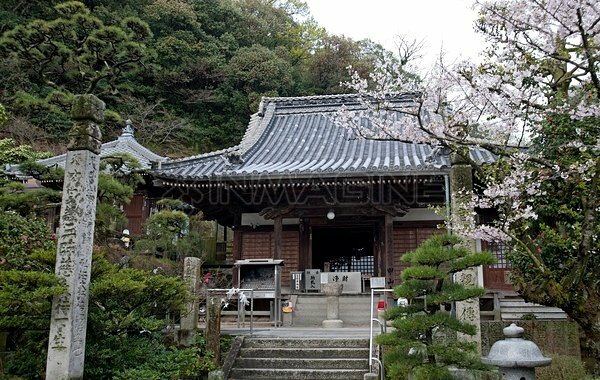 Kannonji had a newer architectural element, and I thought it blended in well with the rest of the older temple architecture. It was a two-story, modernist white gate to the hondo. It gave a feeling of purity before you step up to the hondo for prayers. It also provided some shelter to a horde of pilgrims doing prayers there. 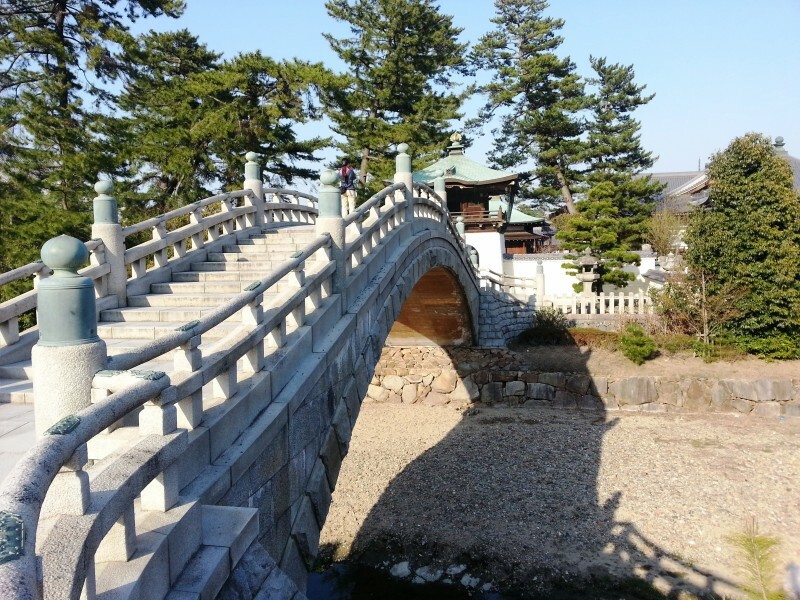 After we finished at these two temples, we walked mostly along the Saita River for about five kms. We accidentally missed a turn, and I asked someone for directions. He not only helped us, when we started to go a bit astray from his directions, he yelled from quite a distance, telling us to take a right up ahead. 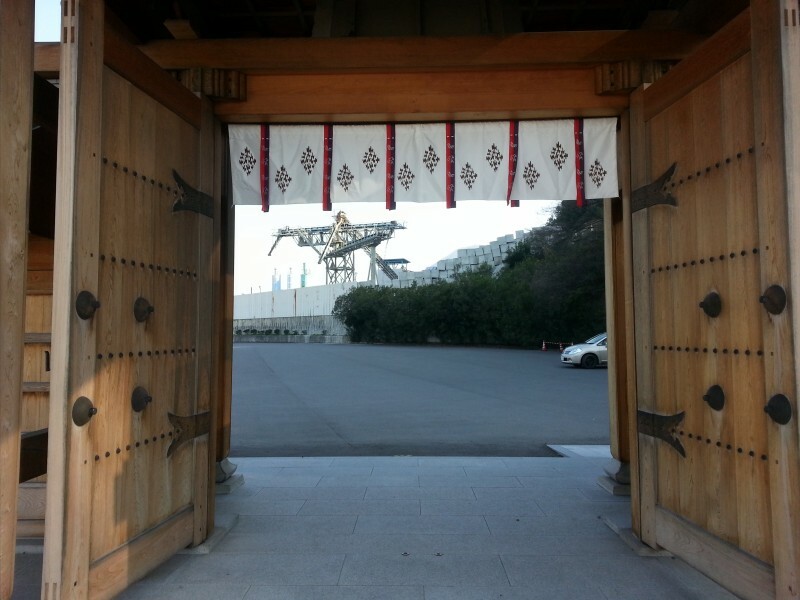 We were able to find Motoyamaji, Temple 70, by steering for its tall, stately pagoda. 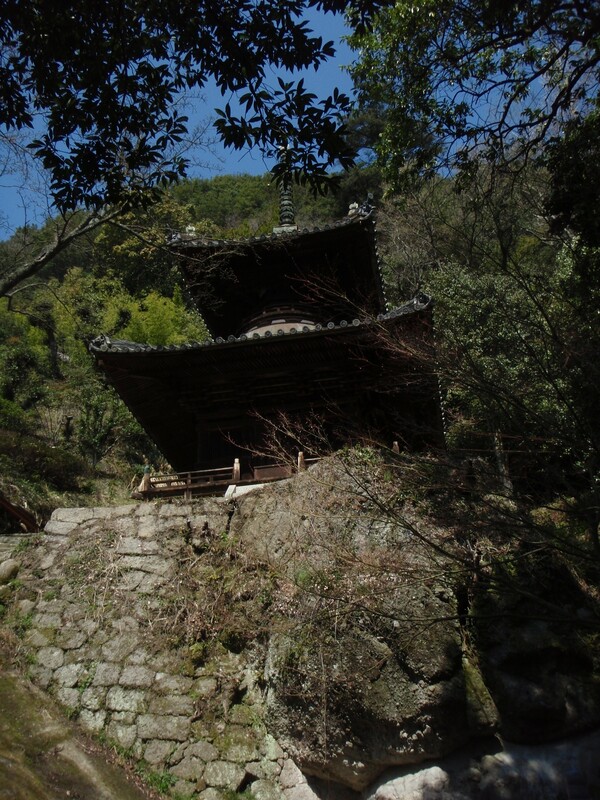 Motoyamaji means Mountain Origin Temple, but it was on flat ground. The temple complex was spacious and the buildings were relatively large, conveying a feeling of grandeur. The temple was founded in 807 and has never burnt to the ground — unusual for one in a relatively accessible location. Usually any temple near a population center was razed in one war or another. I met a nice temple cat there, and petted it while we sort of hung out at the stamp office. Someone at the temple gave us soy milk drink boxes as osettai while we were there, which was nice. When we left the temple, we walked a few blocks to a big highway, Route 11, and turned then on another arterial, Route 237. This sort of environment is not the best for walking, but it was the most direct way back to our lodging. It also had plentiful eating opportunities. We ate a sushi place, then tromped through the pouring rain along Route 237. The rest of the day, we spent in our room. Ann read, and I caught up on blogging. I’m glad we spent the afternoon of this very damp day indoors. Recently, the magazine Mental Floss published an article translating travel tips for Japanese tourists to America. One of the travel tips is, “American food is flat to the taste, indifferent in the subtle difference of taste”. Commenters flipped out about this, and talked about how some American regional cuisines are quite spicy, or about the availability of a wide array of ethnic foods in the US, all of which have very different flavors. But I think that these commenters miss the point. In Kannoji, Ann and I ate dinner at a Joyfull. Joyfull is the Japanese equivalent of a Denny’s. It’s a big chain diner that is typically sited by the highway, and provides mostly unimaginative, corporate “Western” food. At the Joyfull, I had a green salad, and on the salad was a tomato wedge. I want you to imagine what a tomato wedge would taste like at a Denny’s. It would be a piece of red pulp, there for color interest. Its flavor would only very remotely resemble that of a tomato. Now, I want you to imagine a fresh garden tomato, red, ripe, and warmed by the summer sunshine. Imagine its intense tomato flavor. If the Denny’s tomato is a 1 on a scale, and the summer garden tomato is a 10 on this scale, then the tomato I ate at the Joyfull was an 8. Not quite as good as a sun-kissed garden tomato, but very flavorful and definitely tomato-y. This is the way food tastes like in Japan. It tastes intensely like it is supposed to. Meats taste like their respective meats. All fruits and vegetables have an amazing flavor. I ate a strawberry that was out of this world – like a local, not-shipped strawberry; only large, like a straw-no-flavor, trucked from Mexico berry. When I lived in Japan before, I lived in an urban area. 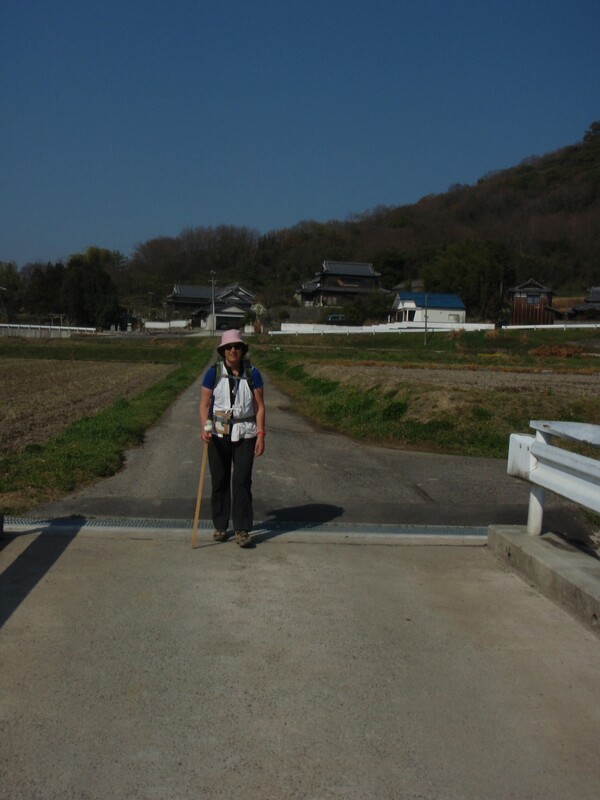 On Shikoku, we walked through a lot of suburbia, exurbia, and rural areas. I saw a lot of food being grown. The farming methods are intensive. Water is carefully channeled off the mountainsides and directed into fields and rice paddies simply through gravity. Rows of vegetables are started covered in black plastic to protect them from bugs and make weeding easy. Hothouses are covered in clear plastic to be able to grow things year-round and also protect the crops from pests. I never once saw someone spray or smelled the chemical residue of a pesticide. It may not be that everything is grown organically, but it looks like it. Through our time in Shikoku, it was spring, so we saw rice being planted and it growing into vigorous green shoots on nearly any level surface big enough to accommodate a small cultivator. With this form of agriculture, wildlife abounds. All those waterways have herons and egrets standing in them, fishing, Butterflies flit by like they used to when I was a kid, and we still had butterflies. And then: for all the houses we saw in suburbia and exurbia – I never saw a lawn. If you had no yard at all, you grew flowers or had strings of sugar snap peas working their way from a 8″ x 24″ pot. But if you did have a yard, you had flowers, and a vegetable garden, or fruit trees. If a yard as big as our suburban plot were in Shikoku, the front yard would have about four orange trees (unless we wanted to grow an ornamental pine or cherry blossom tree), and the backyard would be a rice paddy, or the whole thing would be a vegetable garden. On the way to Sankakuji, I saw a neighborhood produce vending machine. Vending machines are ubiquitous in Japan. This one, though, was for people who grew more produce than they could consume themselves, to benefit the neighborhood. Exactly how these things work, I’m not sure. If you get a dozen oranges from it for 300 yen, I don’t know how the money gets split between the owner of the vending machine, and the orange grower, and how you get your money out of it. But I have seen these kinds of vending machines in Japan before. It’s a way to deal with surplus produce, without having to go to the hassle of running a farm stand. Also, all over Shikoku, you see self-serve rice hulling booths. If you have grown some rice on your property, you can bring it to the rice hulling booth by the side of the road. You dump your rice in, make your payment, and you get out your rice brown, or completely polished, depending on your setting. If nearly everyone then is a farmer, it’s not surprising that very little produce appears to be imported. The only thing I saw that was imported was bananas – little bananas from the Philippines, big bananas from Ecuador. I’ve read on-line that 60% of the food in Japan is imported. Maybe dairy products, as I never saw a dairy cow. Maybe in the cities. But I saw little evidence of imported food in Shikoku. People ate local produce, ate local eggs, ate fish that came from local seas – very little beef, pork or chicken. So, when the Japanese are warned that American food is bland, they don’t mean, “not spicy”. They mean, “not flavorful”. Japanese food is flavorful. It isn’t grown so it can be trucked 2000 miles from Mexico. It’s grown so it will taste good. And the only lawns I saw were in parks, at recreational facilities. Never in front of someone’s private home. What if we spent as much time and money cultivating food as we do on lawn care? What would our food supply look like, taste like, then? Temple 65, Sankakuji, was a good 45 kms away from our previous cluster of temples, so we took the train to (Iyo-) Mishima. Until we made it to Takamatsu, the next series of temples were in the vicinity of “rust belt” cities, that might have been prosperous a generation ago, but now looked a little worn around the edges. When we got off the train in Mishima, the tourist map outside the train station proudly noted where its municipal waste incineration plant was, and where it had located its crematorium. If this is what you put on your tourist map, I think you don’t have a lot to boast about in your town. We dumped our heavy packs at the station (at the koin rokkaa) and just took our sutra bags. Then we walked to the Family Mart and bought ourselves a picnic lunch. If no one was looking, I hung the sack off my pilgrim staff like a bindlestiff – it was heavy. Otherwise, since I didn’t want to cause offense, I carried it in my hand. Another long block up the hill from the Family Mart, and we were on the official henro path again. Once we got up and under the expressway, we were no longer in the somewhat depressing urban area, and on its surburban fringe. The houses thinned out into orange groves, and then we were on the wooded trail, climbing up. Sankakuji is not on top of Mt. Hiraishi (at 825 m), but about halfway up, set into the hill. This of course means the inevitable long stone staircase from the temple gates to the buildings at the top. They had some lovely flowers at their temple, and after we did all our temple rituals, we had a pleasant picnic lunch at its benches. I meant to navigate back the way we came, but I wasn’t successful. We came down a road instead of the trail. I was nervous about being on the right road, because being on the wrong one would send us an additional 20 kms east, towards the next temple, as opposed to northwest, back to the rail station where we had all our stuff. However, by the time we hit the bottom, we came to something that looked pretty close to the indicated School for Handicapped Children on the map. From there, it wasn’t difficult to get ourselves back on track, and return to the railway station. From there, we took the train all the way to Kannonji, and settled in for the night. The next morning, I got up bright and early to hit the trail. The first order of the day was to climb to Temple 60, Yokomineji. For all I knew, this would take most of the day, as the temple is on a mountaintop. After climbing up on the road, I came to the trailhead. The trail clearly was closed. In an overly-thorough Japanese manner, the map they provided as guidance should all the paths I could not take as well as the correct route, and a plasticized sheet of instructions far over my reading level. While I stood there, puzzling this out, a woman pulls up in a Crown Royal Saloon. As it turned out, she had driven up to the trailhead to fill a dozen four liter bottles with mountain spring water. She told me I could not use the path here (yeah, at least this I could noodle out), and offered to drive me to an alternative trailhead. I helped her fill her bottles, hopped into her car, and she took off. Like many who gave us help along the way, she had done the pilgrimage in the past, and was happy to provide assistance. As we drove to the other trailhead, I saw groups of pilgrims doing ascetic training with a monk in the lead, as well as recognizing one or two folks that I had met up with previously on the trail, including the man who showed me the temple guardians two days before. Finally, she dropped me off, and I waved goodbye with my thanks. This trailhead was about two kms closer to the temple, so she saved me some steps as well as getting me to a safe way up the hill. The trail was very steep here, nothing but steps switchbacking through the forest. However, it really didn’t go on for long, and I was up at the temple. Piles of snow were still melting here, even this late in the season. While we were in the forest, there was not much of a view, other than of other temple buildings. I did my prayers and meditations, and then went to the nokyo office. Since the easiest way down was not the way I had just come, but the way with the blocked path, I asked the monk if it was possible to go down that way. He responded that of course it was safe, leaving me scratching my head, but if you can’t trust a monk…. As I left the temple grounds, I could hear the sounding of a conch echoing through the hills. To listen to a conch calling people to prayer is like hearing a shofar. The sound has been the same through the centuries. Most of the trail through this next section was up and down the ridge line. It was here, on this trail, that I saw my baby snakes. I also heard here lots of other rustling through the leaves, and figured I was best off tapping my stick as I walked along. The trail also crisscrossed logging roads and powerline maintenance trails as I loped along. Everything was well-marked, but in Japanese. If you didn’t know the characters for “electrical power” you might have gone astray. Finally, the trail dropped to a crossing, and I opted to continue on what should be the closed trail. And, it wasn’t long before the trail was roped off. But this time, there was a simple sign with an arrow marking the detour. The detour was well-maintained, a series of even switchbacks down the hillside. I stopped at one with a bench, and had lunch, and looked the view. I came back through Temple 61, Kouonji. The guidebook says that it is known for its modern concrete structures. To me, this temple’s buildings and courtyard had all the charm of a quad at a mediocre Christian college (as the former manager of the Washington Higher Education Facilities Authority, I’ll not mention which one). But the staff was very nice at the nokyo office. By the time I was back in town, it was still before 2:00, and Ann and I decided that we might as well catch a few more temples while we were in town. It was supposedly only about a kilometer to Kichijoji, Temple 63, but once again we missed the turn. We caught up to a woman henro about our age, Keiko, and she confirmed that we were well on the way to Maejamiji, Temple 64. Rather than go back, we pushed on. Outside Maejamiji, I saw one of the few beggars I’d ever see along the henro path, and gave him one of the oranges that I had received as osettai at some point or another. After visiting Maejamiji, Keiko confirmed the route down the hill to the train station. Through some miracle, we just made it on to the wanman train. If we had missed this train, we would have had more than an hour’s wait, and would not been able to make it back to Kichijoji before it closed, either on foot or by train. We got off, visited the temple, and then did the 1 km walk back to our inn. This time they served sukiyaki, and we ate heartily. It was a big day of walking for me, and I was glad to have the food and the rest. After so much walking the day before, this was a much lower-key day. We walked out to Kokobunji, Temple 59, in the morning. It was another brilliantly sunny day. 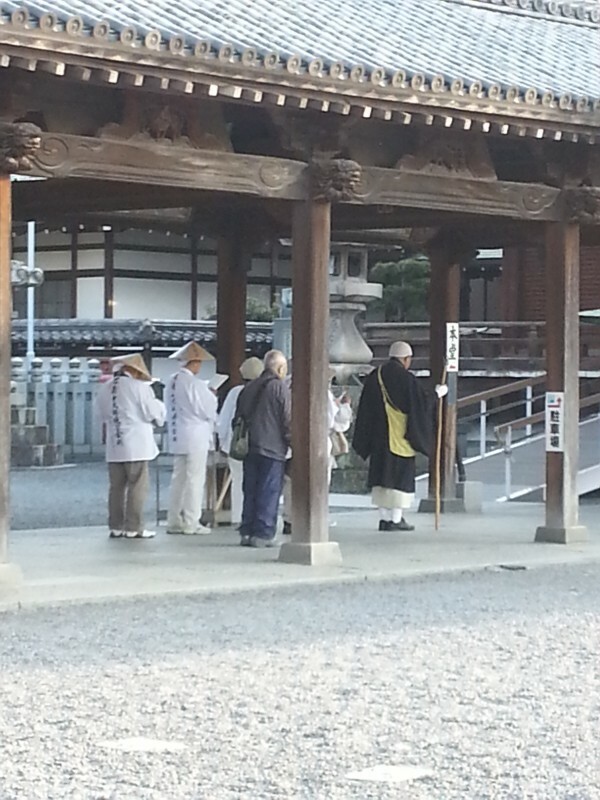 The temple had a statue of Kobo Daishi with whom you could shake hands, which I did. You also could rub an afflicted body part for healing on a vase of the Healing Buddha, and I put my feet on this, because, what the heck. When we walked out, there were several small booths selling the usual collection of snacks, temple items, and souvenirs. We bought a box of candles, and struck up a conversation with the young proprietor. He offered us a towel each as osettai, and then took us in to his little shop. He then embroidered, with his fancy computerized embroidery machine, I think, the words, Once in a Lifetime in Japanese on each towel. Then he took our pictures, and posted them to Facebook. After this, we caught the bus to the train station, ate lunch, and went out to the town of Komatsu. 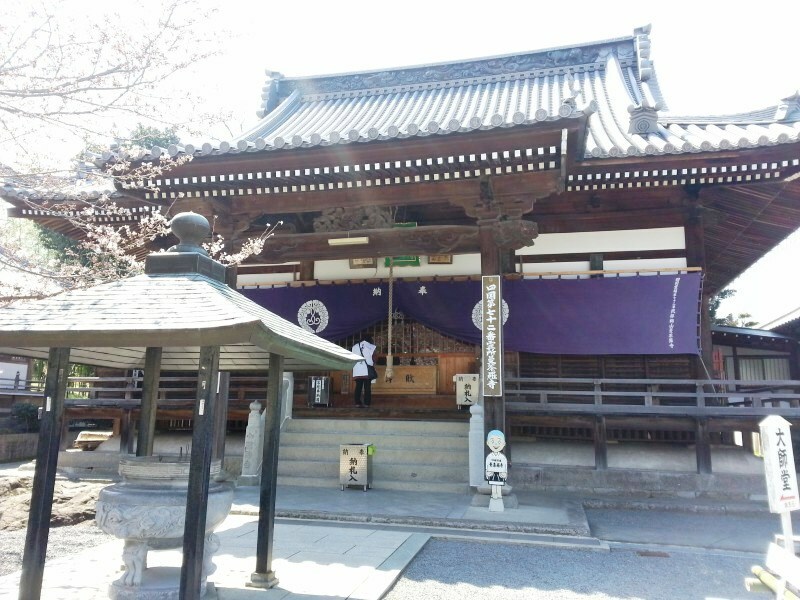 We then visited Temple 62, Horyuji, mainly because it was a stone’s throw from the station. It was a small, compact temple, and it didn’t take long to do our usual candle lighting, incense, and prayers. We then simply hung out at the temple, reading and relaxing. We checked in to our inn as early as we thought we could get away with. They said that they were completely booked, so we would need to stay in their annex. We were then led around the corner, up a narrow starcase a couple of flights, to a little flat. This “annex” consisted of a kitchen, two tatami rooms, and a Western room, which is where I guess they decided us Westerners should stay. The room was furnished in Early Jumble Sale, and the mattresses looked well-broken in, but Ann seems to sleep better on any bed compared to a futon, so she was a-ok with this. I brewed a pot of green tea in the kitchen, while Ann did more reading. 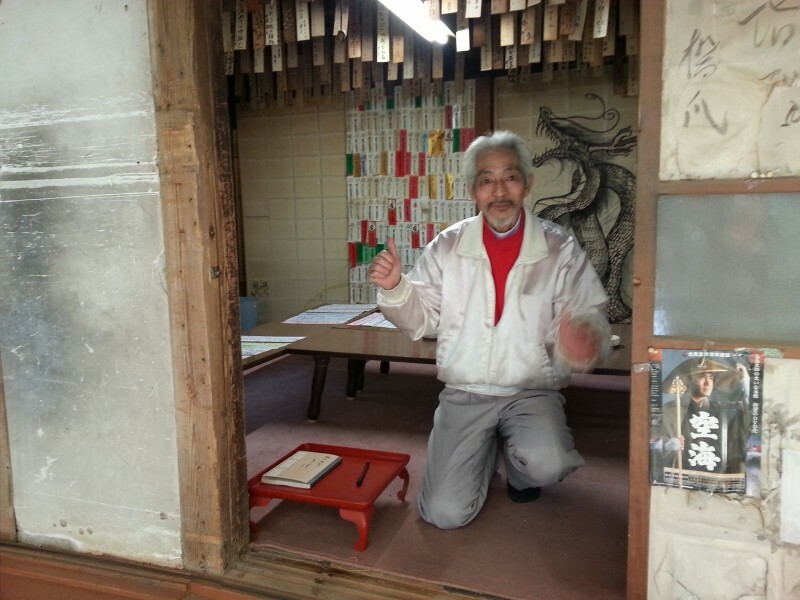 A Japanese man took one of the tatami rooms. I thought how unusual this would be in the US, where we were sharing an apartment for one night with a complete stranger, and no way to lock anything. When we walked to the dining room for dinner, it was clear that indeed the inn was full. About fifteen or sixteen people, all apparently pilgrims, were seated at the tables on the floor. Then enormous platters came out for us to make shabu-shabu. We ate a ton of shabu-shabu, more than we deserved for a day of largely loafing, and returned to our “annex” for bath and bed.